The Christmas tree is up, our coal stove is roaring, and my Pandora Christmas jazz station is softly serenading us. This is the time of year when I most relate to the hibernating bear... not the sleeping part; the part where he doesn't leave his den. No, I'm not depressed... it's just that after we deck our halls, our den is at its coziest, and I hate to have to venture into the cold, dark-too-early places on the other side of my walls. A simple reality check reveals that our schedule has us out every night of the week. A girl can dream, can't she? This time of year, I also find myself using my oven a lot more than usual. 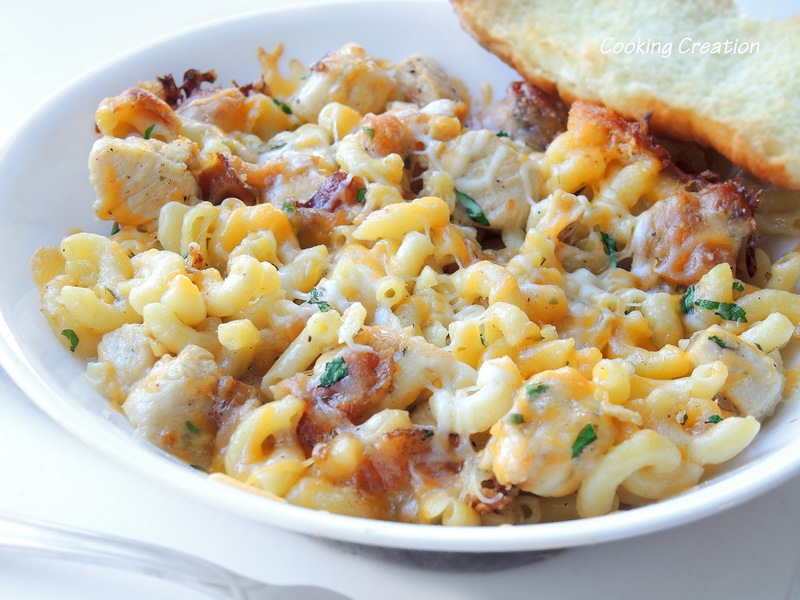 We had this Baked Chicken, Bacon & Ranch Macaroni and Cheese last night, and it really is amazing. I mean, can you really go wrong with these ingredients?! I couldn't wait until lunch today to have it leftover, and it was just as good! Give it a try; you won't be disappointed! A crisp salad, garlic bread, and steamed vegetables are perfect complements to this dish!